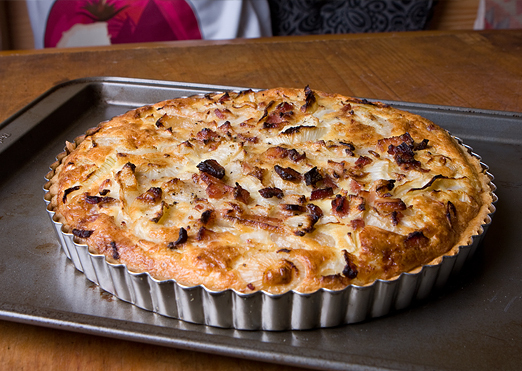 This German Zwiebelkuchen is a bacon and onion tart and was one of the savoury tarts we made for the Chardonnay tasting. Very nice for those who are not vegetarian since this one has bacon. 1. First make the pastry. Put the flour, butter and salt in a food processor and pulse until the mixture looks like breadcrumbs. Add the egg yolk, then pour in the milk in a gradual stream. Watch carefully and stop adding the milk as soon as the dough starts to come together. Turn out and knead lightly a couple of times, then wrap in cling film. Chill for half an hour. 2. On a lightly floured surface, roll the pastry out quite thinly and use to line a 25cm (9.84″) loose-based tart tin, letting the excess pastry hang over the edges. Line the pastry case with greaseproof paper, fill with baking beans and place in an oven preheated to 340 ºF. Bake blind for 20 minutes, then take the tart out of the oven, remove the paper and beans, lightly prick the base all over with a fork and return to the oven for 5 minutes, until the base is dry but not too coloured. Carefully trim off the excess pastry with a small, sharp knife. Turn the oven temperature up to 360 ºF. 3. Saute the onion ‘rings’ with the bacon in a large skillet, until the onions are transparent, and soft. This should take about 10 minutes. Then pour the onion and bacon mixture into the pastry shell and spread it out evenly. In a separate bowl, mix the eggs, the crème fraîche, Gort’s Gouda, a pinch of salt, the nutmeg, and pepper together with a whisk until well incorporated and smooth. 4. Pour the egg-crème fraîche mixture into the baked pastry over the onion mixture and put it in the oven for approx 30 minutes, or until golden brown on top. If you make this recipe, take a picture and we’ll post it… and enter your name in our next contest!